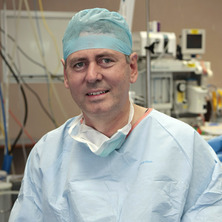 Breast and Endocrine Surgeon, Mater Hospitals South Brisbane. Pyke, C. (2011) Anaphylaxis and patent Blue V. Anaesthesia and Intensive Care, 39 4: 758-758. Letter to the editor re: "Safety of hormone replacement therapy after mastectomy" by Christopher B Del Mar, Paul P. Glasziou. Pyke, Christopher M. (2002) Letter to the editor re: "Safety of hormone replacement therapy after mastectomy" by Christopher B Del Mar, Paul P. Glasziou.. Medical Journal of Australia, 176 12: 618-618. Pyke, CM (2002) Safety of hormone replacement therapy after mastectomy. Medical Journal of Australia, 176 12: 618-618. Is parathyroid hormone-related protein a sensitive serum marker in advanced breast cancer? Pyke, Christopher M., Grant, Clive S., Habermann, Thomas M., Kurtin, Paul J., van Heerden, Jon A., Bergstralh, Erik J., Kunselman, Allen and Hay, Ian D. (1992) Non-Hodgkin's lymphoma of the thyroid: Is more than biopsy necessary?. World Journal of Surgery, 16 4: 604-609. Pyke, C. M., Donohue, J. H. and Lewis, J. E. (1992) Late anastomotic recurrence after radical resection of carcinoma of the ampulla of Vater: case report. Surgery, 111 6: 714-717. The spectrum of serous cystadenoma of the pancreas: Clinical, pathologic, and surgical aspects. Pyke, C. M., Hay, I. D., Goellner, J. R., Bergstralh, E. J., van Heerden, J. A. and Grant C. S. (1991) Prognostic significance of calcitonin immunoreactivity, amyloid staining, and flow cytometric DNA measurements in medullary thyroid carcinoma. Surgery, 110 6: 964-970. Scott, JL, Halford, WK, McGuckin, MA, Ward, BG, Wetzig, NR and Pyke, C (2003). How can we disseminate psycho-oncology interventions to oncology and community settings? Results from a trial of a self-directed coping training program for women with cancer, and their closest support persons. In: Australian Journal of Psychology. , , (211-211). .
Pyke, Chris (2005). Risk quantification, therapeutic morbidity and quality of life in breast cancer PhD Thesis, School of Medicine, The University of Queensland.